WLAN devices support the following features: L2/L3 networking, inline/bypass mode, direct forwarding/tunnel forwarding (supported by IPv4); static and dynamic Option 43; MAC address or SN based authentication or non-authentication; the AC delivers configurations to APs; WEP, WPA-PSK, and WPA2-PSK authentication; 802.1x access authentication for WPA/WPA2; data encryption not supported; dual link backup; L2/L3 roaming; simulate APs to provide 2.4G or 5G signals; simulate STAs to connect to APs. The AR further supports the following features: IPv6 transition; DHCPv6; NetStream. 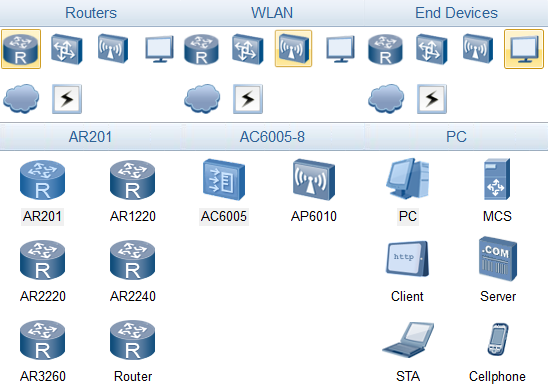 Added router of eNSP 1.0.